Roma Wines 1956 Ad. 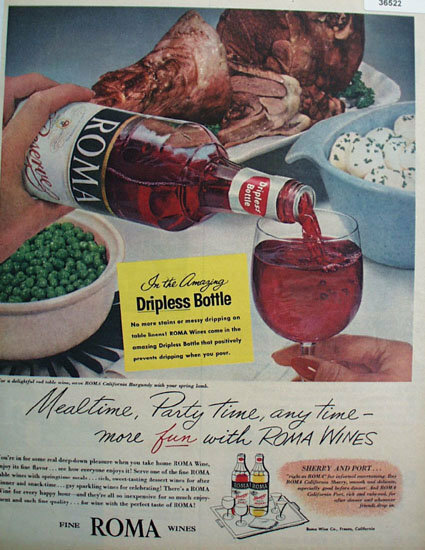 This color April 3, 1956 ad states Mealtime, party time, any time, more fun with Roma Wines, Sherry and Port. Picture shows platter of Ham, bowl of Potatoes and peas on table. Roma Wine is being poured out of Dripless bottle into Glass. Magazine tear sheet picture is taken through plastic and may show wrinkles or crookedness that is not in the ad. This Original magazine tear sheet measures 10 inches wide by 13 1/4 inches tall. Items Similar To "Roma Wines 1956 Ad"